I am going to New Hampshire/Massachusetts this summer and one of the things I want to do is see the Macy-Colby House. 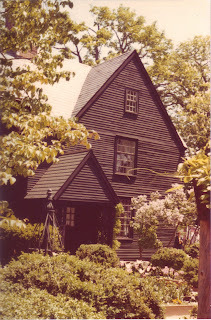 This house was built by Thomas Macy in 1649 in Amesbury, MA. He sold it to Anthony Colby, my ancestor in about 1654. The house remained in the Colby family for over 245 years. I can't really tell from the pictures on the website, but the house looks like a two up/two down with a lean to on the back. It is, by most standards, a pretty primitive house. However, according to the website, it was extensively renovated in 1740 by Obadiah Colby. If this is what the house looks like after renovations, what I wonder was the original house like? The Macy-Colby house and others like it are called first period houses. They were built between the arrival of the first colonist in 1626 until 1725. The first arrivals lived in tents until more permanent structures could be built. Some built Indian style wigwams as a form of temporary shelter. 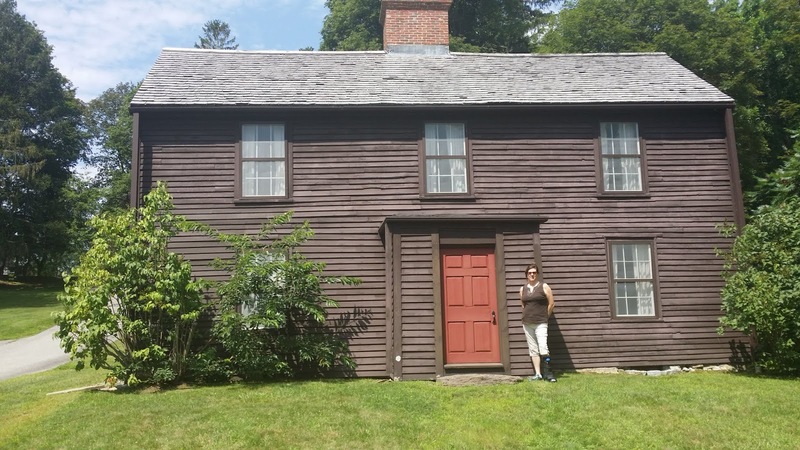 For many their first home in New England was a single room with a dirt floor and papered windows. When these people arrived, time was of the essence. They needed shelter and they needed to break ground and plant crops to feed themselves. As soon as adequate shelter was in place, time and effort went into cultivation and procurement of food. There was little or no time for building more elaborate housing. Sure, there were men like Thomas Dudley, who was wealthy and able to put resources into building his home, in fact, he was ridiculed by John Winthrop for his wainscoting he had made for his house. But, the vast majority of the new arrivals did not have the luxury of hiring craftsmen and builders to create their ideal home. English immigrants built houses that resembled those that they had left behind. 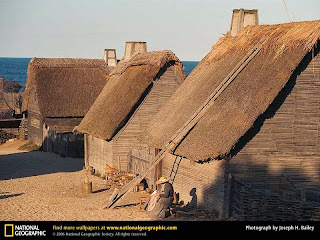 Many of the First Period houses of New England had their roots in the medieval homes and cottages of East Anglia in England. These houses had steeply pitched roofs and exposed beams inside. They had a central fireplace, at first made of wood, covered with a mud plaster, making them extremely susceptible to fires. Add that to a thatch roof and you have a recipe for disaster. Later fireplaces were made of brick. The newly built homes more often than not were either single story with a loft or two story. When you added on a lean to you got the typical New England Saltbox house. Most of these early houses were of a type known as Hall and Parlor. The front door opened directly into the main living space. The building had two rooms, one large one smaller, with either a fireplace in between or on each end. The house may have started out as single room that was added to when time and money were available. The hall was used as a great room. This was were the women spun and sewed, where the family ate, conducted business, and where they slept. The smaller room, the parlor, was was used for more private conversations and transactions. a lean to might be added to the length of the house or included in the original house and incorporated into the roof line. This room was used for storage, as a service room or kitchen, even as a sleeping quarters. If there was a second story, the staircase would be built next to the central chimney. Second floor rooms, usually called chambers, were not necessarily used as bedroom, often they were used as a storage room for valuables and for grain. Another storage option was the cellar. This was not a cellar in the sense that we know now, but more of a underground accessible space for the storage of root vegetables and other consumables that require "refrigeration". When time, money and status allowed, the New England houses began to alter from this original Hall and Parlor design. Additional wings might be added to one or both ends of the house. One important characteristic was the jettied upper story. In this style house the second story hung over the first. Glass diamond pane windows were added until the arrival in about 1700 of the double hung sash window. The salt box might get a new look with a gabled roof which added architectural interest to the house. Another welcome addition was the central hallway, this usually included the addition of a new style entryway that did not open directly onto a room, but allowed one to enter the house without letting in the elements as well. The biggest change from English to New England house was the incorporation of the kitchen into the house itself as opposed to a separate entity. A unique feature, available to the very wealthy, was an architectural feature known as gables. Instead of a single roof, each element of the house had its own smaller "gabled" roof. The Turner-Ingersoll Mansion in Salem is a great example of this style. The house is best known by the name The House of Seven Gables. As I sit in my large modern central air and heat home, I wonder how my ancestors lived in their tiny houses. The average two room house was probably no more than 400 square feet which included the massive chimney stack and hearth. Most of these families had 10 or more children. I think the thing that would bother me the most would be the lack of privacy. Actually, I take that back, the thing that would bother me the most would be the lack of a bathroom! Stull, Scott D, The Social Order of the Colonial House in Massachusetts, State University of New York, 2000. Hackett, David Fischer, Albion's Seed, Four British Folkways in America, Oxford University Press, New York, 1989, pg. 62-68. Deetz, Patricia Scott and Deetz, James, Vernacular House Forms in Seventeenth Century Plymouth Colony, University of Virginia, 1998. In his book on the descendants of James Thornton, Charles Thornton Adams mentions but briefly Sally the daughter of Samuel and Katherine Baker Thornton. He called her Sally "the preacher" Thornton. He said she built a church in Thornton,NH and was a gifted speaker. I've always wondered who should a woman be preaching in that era? I decided to try to find Sally "the preacher" in the records. Here is what I've found. 1809 Sally's parents were living in Hatley Quebec during the first 20 or so years of their marriage. Their second child, David, was born in Hatley in 1808. Their last child, John, was also born in Hatley, in 1818. It seems safe to say that their daughter Sally, born in 1809, would have also been born in Hatley. There is no record of her birth, or that of her siblings for that matter. 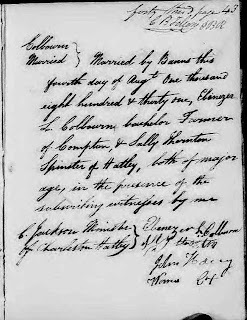 1831 Sally's oldest sister, Hannah, married Shepard Morse in Hatley in 1822. 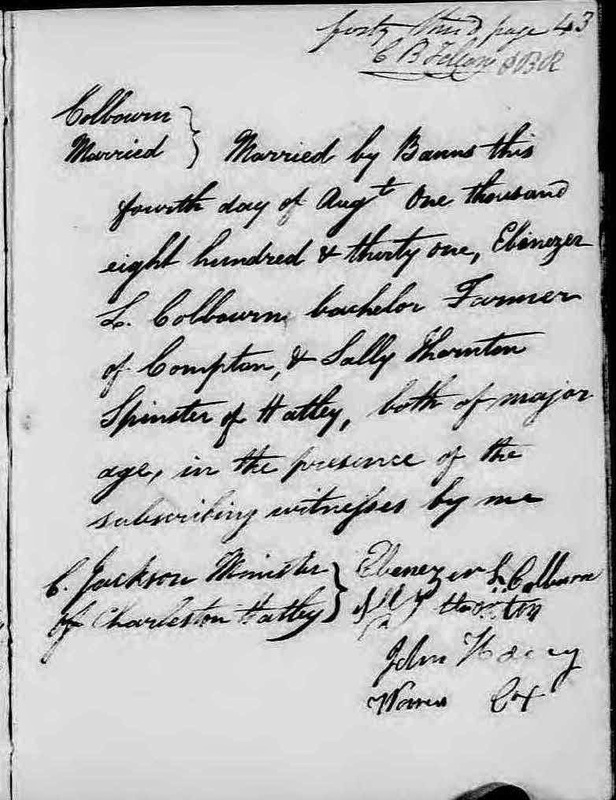 In 1831 a Miss Sally Thornton married Ebenezer L. Colborn in Hatley, Quebec. Sally is a nickname for Sarah. Is this Sarah Thornton our Sally Thornton? 1838 In 1838 a Mary Jane Colborn was born in Campton, NH. 1843 Elvira Colborn was born in New Hampshire. 1850 A Sarah Colburn lives with her husband Ebenezer and daughters Mary J. and Elvira in Lowell, Middlesex, Massachusetts. The census states that Sarah was born in 1809 in Canada. Her daughters were born in New Hampshire. Husband was working in a cotton mill. He was born in New Hampshire in 1809. 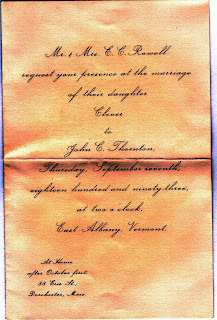 1857 On 31 Dec of 1857 Mary Jane Colborn married Hiram J. Ray in Manchester, NH. No parents were recorded. The couple lived in Concord, NH. 1860 In a town next to Campton, called Rumney, lives E. L Colburn and his wife Sally. Also in the house is a son with the initials B.F. he was born in 1852. 1870 In this census Hiram J. Ray and his wife Mary Jane and their daughter Gertie Bell live in Concord, NH. With them lives her mother Sarah Colburne, widow, born about 1810 in Canada. 1880 Living in Concord are the Hiram, Mary Jane, Gertie Bell, Nettie J. Ray and Sarah Colburn, age 71. Sarah was born in 1809 in NH, according to the census. 1893 On the 15th of April 1893 died one Sarah C. Ring of Laconia, NH. She was born in 1809 in Hatley, Quebec. She was buried in Campton, NH. Her mother was Catherine Baker, born in Campton. 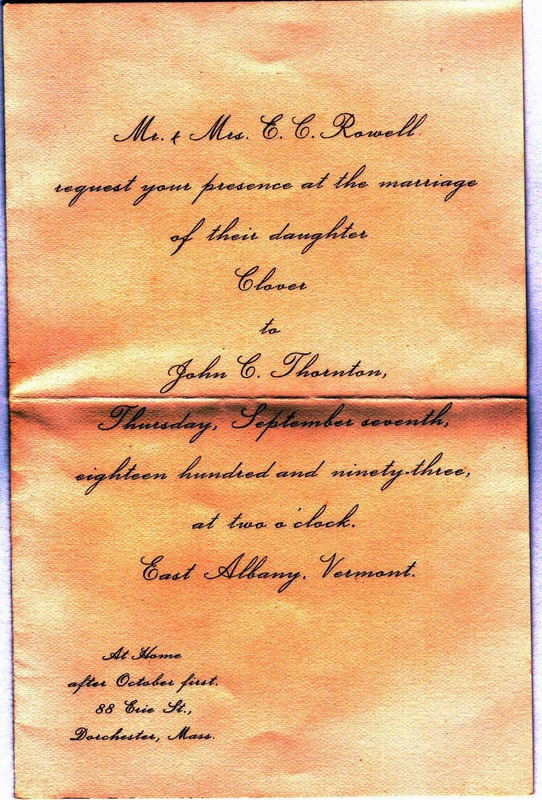 The only stumbling block here is the father, he is listed as John Thornton, born in Campton, NH. If this was our Sally Thornton, her mother was Catherine Baker from Campton, but remember her father's name was Samuel. I think this is her. I think whoever gave her information at her death got the father's name wrong. What do you think? Is this Sally the Preacher? 1900 Hiram and Mary Jane live in Laconia, NH. Hiram died age 58 in July. 1917 Mary Jane Ray died in Billerica, her daughter and husband lived in Billerica. John Clark Thornton was my great grandfather. 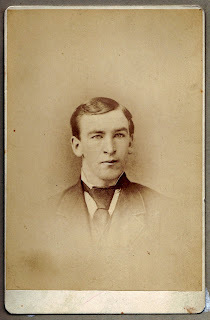 He was the last born child of Samuel and Chloe Blanchard Thornton of Wheelock, Vermont. John was born on 23 June 1859. His father was a farmer, born in Canada, who spent most of his life in Vermont. Samuel's parents were American, but took advantage of land opening up in Canada in about 1800. They eventually moved south into Vermont. In 1860, according to the census, the family lived in Wheelock, but by 1870 they had moved some 18 miles to the west and settled in the little town of Hardwick. Samuel's farm was on the Caledonia Greensboro County line, with some land in each county. Samuel had maple trees which he tapped for syrup. John's father died at the age of 58 in 1874, his mother Chloe died two years later. He was only 15 when his father died and orphaned at 17. In 1875 the Thornton children were forced to sell the farm to cover Samuel's debts. But, I think, John was a smart determined young man and in the 1880 census he was the head of the household. Living with him were his sister Maria Niles and her son Olin and their brother Benjamin Franklin Thornton. Maria had married Van Doran Niles in 1876, she lost a baby in January of 1880, I don't know why she was living with her brother John, but Van Doran did have an affair later in their marriage, so maybe things were not so good between them. But that is just speculation on my part. Their brother Nathan died of tuberculosis in 1878, the rest of the siblings were married and lived on their own. On New Years Eve in 1885 John married Laura "Nettie" Hazen. He was 26 and she was 19. I'm sure he had every expectation that they would live a long happy life together, but it was not to be. Less than a year later she was dead of Typhoid fever. I can only imagine what a blow this was to him. In 1889 John C. pops up in Boston, MA of all places. I found him in a Boston City Directory. He lived at 146 Seaver St. His occupation was listed as Butter Dealer. So, how does a sugar maple farmer from Vermont end up a butter dealer in Boston? Did the loss of his wife cause him to leave? I don't know, but I do know that he lived at the same address as his first cousin Dudley Clark Thornton. Dudley was the son of David Thornton and Lydia Clark, hence the middle name Clark for both John and Dudley. Dudley had an older brother also called John Clark Thornton who died in 1873. David Thornton left Vermont in 1860 after the death of four of his children from Scarlet Fever. He and Lydia settled on her family farm in Campton, NH. Dudley married in 1865 and had three children before he left New Hampshire and his family for Boston. In 1877 he remarried and began a new life. Dudley had another brother Jared D. Thornton who had also left New Hampshire for Massachusetts. He was a dairy farmer. Did these two brothers help their cousin find a new career as a butter dealer? 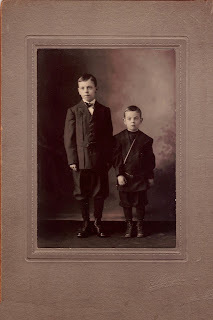 By 1893 the cousins, John and Dudley, had moved to 88 Erie St. in Dorchester. John Clark would make another life change in 1893. In September of that year he remarried; his bride was Miss Jennie Clover Rowell of Albany, Orleans, Vermont. She was the 26 year old daughter of Enoch Converse Rowell and Viola Rowell. So how did these two meet? I have no idea! I do know that she was an accomplished pianist. Dudley and his wife moved to nearby McLellan St. the next year. John C. and Jennie Clover lived on Erie St. for many years. In 1899, my grandfather, Paul Rowell Thornton was born, and so began J.C. Thornton Co.
Jennie had only two children, one after six years of marriage, the second born five years later. Wayne who was born in 1904, was a cute little boy. He died when he was six years old of post diphtheria syndrome. It is tragic to read about all these people who died of communicable diseases that are so easy to prevent and/or cure with today's medicine. I get really mad when I hear about parent's not vaccinating their children I wonder if they have idea what could happen to them. But, that's a soapbox for another platform. John Clark Thornton's business was a success. He delivered butter and eggs in a horse drawn wagon. Eventually he would buy motorized trucks. His sister-in-law, Mary Viola Rowell, moved in with them and help run the business. My dad said that he could remember her checking eggs under a light to see if they were fertilized. My grandfather Paul worked for the company as well. He met my grandmother, who worked as a house maid, when he was making deliveries to the house where she worked. John Clark Thornton had several houses built in Brookline, MA. One, at 24 Bartlett Crescent and 793 Washington St. were back to back. John and his family lived at the Bartlett Crescent house which also housed the business. My grandfather eventually lived in and raised his family in the Washington St. house. John also built a three story house next to the one on Washington St. for a rental property. John Clark died of a sudden heart attack on the morning of July 18, 1925. He was 66 years old. Jennie lived until 1966, she was eight months shy of her 100th birthday. My grandfather continued to run J. C. Thornton Co. until the advent of the grocery store with refrigerated cases for dairy products, put all such delivery services out of business. They are buried in the Forest Hills Cemetery with Wayne and Mary Rowell.